The success or failure of a sport program isn’t just related to what happens on the field—there is a cohort of people behind the scenes who make it all materialize. It takes planning, marketing, venue management, public and community relations, accounting and more to support a thriving sport program at the community, collegiate or professional level. Our Sport Management students learn the business of sport in our hands-on classes. From creating sponsorship proposals to risk management plans, our students graduate with the skills they need to take on anything in the sport management field with a high level of professionalism and expertise. Our Sport Management program takes students from being just fans and teaches them that there is more to the business of sport than the play on the field. 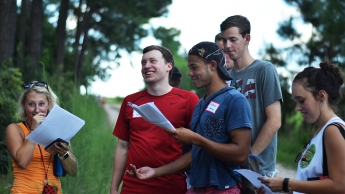 Raleigh has a range of community-based, non-profit, collegiate and professional sports organizations where students can volunteer and intern close to campus. Our program has ties to more than 50 sport organizations nation-wide that offer internships specifically to our students, including our own hometown teams like the Carolina Hurricanes, North Carolina FC and Carolina Panthers. Our unique community-based curriculum also allows students to understand sport beyond the collegiate and professional level and teaches how sport can improve communities by addressing societal challenges ranging from obesity to environmental pollution. Technological advancements continue to change sport organizations and the fan experience. 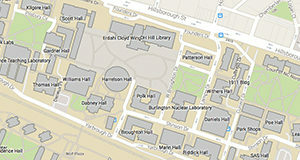 Our geo-visualization lab trains our students on state-of-the-art technology that helps organizations make informed decisions in areas such as facility design, fan-base tracking, and health and fitness trending, making our students competitive for a variety of jobs. Popular minors include Business Administration, Coaching Education, Economics, Health, Journalism, Leadership, Psychology, Spanish and Sports Science. Sport internships lead to careers. 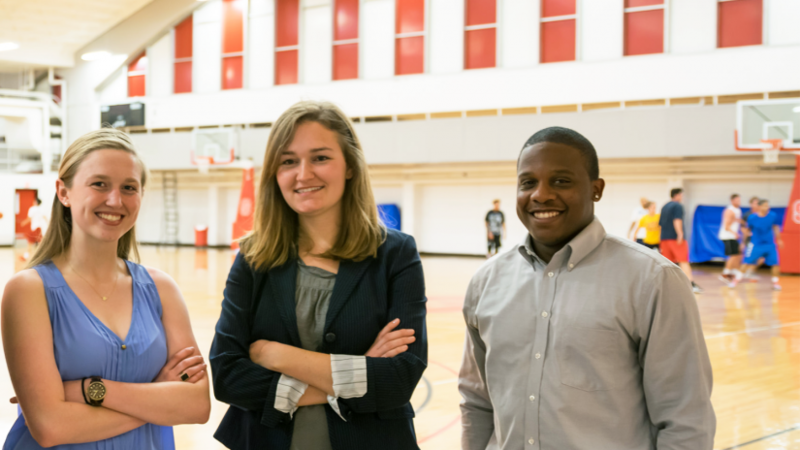 All sport management majors complete a 400-hour internship prior to graduation. Why are Sport Management graduates important? The sport and recreation industry generates around $498 billion in the U.S. and 1.5 trillion globally each year, making sport big business and the skills of our alumni highly desirable and employable. Physical inactivity is responsible for close to 2 million deaths each year globally, according to the World Health Organization, making sport and recreation programs for all ages, and the work of our alumni, more important than ever. Many of our graduates plan, lead and participate in programs specifically designed for youth, supporting the estimated 35 million kids between 5 and 18 who currently play an organized sport each year in the U.S. and the nearly 21 million children who are involved in non-school youth sports. Amanda Dinkel graduated from the College of Natural Resources with a degree in sport management in 2013. Three and a half years later, she went to the Super Bowl with the Atlanta Falcons. Sport Management major Zach Sansavera spent his summer as a Brands Retainer Intern in the Marketing Division at Wasserman, a sport and entertainment consulting agency. In communities large and small, there are sport and recreation programs across the U.S. in need of leaders and experts. By gaining an understanding of the many business aspects of sport and recreation, our students graduate with the knowledge to pursue an array of career paths. The variety of skills they gain are transferable to many elements of business and allow our students to evolve professionally. Simply put, our students graduate with options. Community Athletic Director – General oversight, administration and promotion of the athletic program. Prepare budgets, schedules and trainings. Provide leadership to students and the outside community. Recent employers include the YMCA. Sport Program Director – Responsible for team leadership, development and vision. Develop organize and implement high-quality classes, events and programs. Recent employers include Raleigh Parks, Recreation and Cultural Resources. Assistant Community Relations Director – Responsible for community initiatives, player outreach and youth football programming. Recent employers include the Atlanta Falcons. Assistant Operations Manager – Oversee the production and provision of services to look for efficiency and places for improvement. Recent employers include NASCAR. Youth and Senior Activity Coordinator – Create and implement activities for youth or seniors. Manage large group events, including coordinating all the details and recruiting participants. Recent employers include the U.S. Tennis Association. Community Event Planner – Coordinates all aspects of professional meetings and events, from locations to transportation and logistics. Recent employers include the Jimmy V Foundation. Facilities Manager – Oversee strategic planning and maintain daily operations for all buildings and premises. Recent employers include the New England Patriots. Sports Information Assistant – Provide statistics, team and player notes and other information to news media and the general public. Recent employers include the Harlem Globetrotters. Media Relations Assistant – Moderate information and communication between your organization and media outlets. Recent employers include Reebok.